Mangrove Action Project CELEBRATING 25 YEARS: Who was Jurin Rachapol & why was he murdered? Jan 30th, 2016 is an important, but very sad day as we mark the 15th anniversary of Jurin Ratchapol’s assassination. Jurin was a leading local activist against shrimp farm development which destroyed the mangroves in his home province of Phuket, Thailand. He was just an ordinary man, but cared passionately for the nature around him which provided food and livelihoods for his family and villagers. But it was his courageous campaigning efforts which drew attention and gained recognition from Queen Sirikit who honoured him with an award. Jurin was shot dead in cold blood, at close range on January 30, 2001 while picking cashews near his village home. WHY? 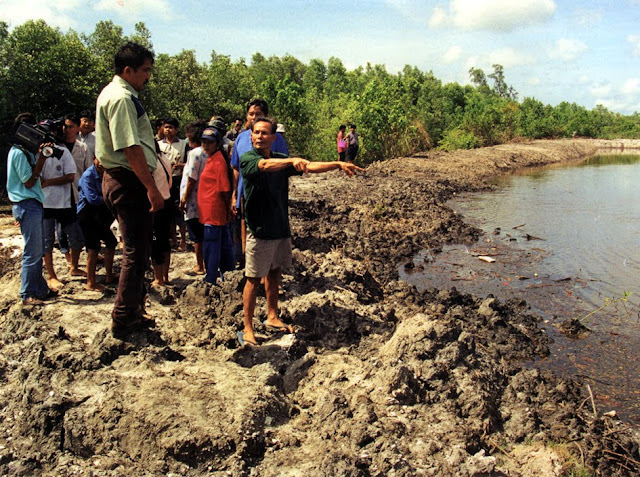 Fifteen years later, how has the situation improved for Phuket’s mangroves? What are the current concerns and what actions are being taken? Have we really learned a lesson from Jurin’s sacrifice and the deadly tsunami which followed a few years later? I am the new intern at the MAP Asia office in Thailand and I was asked to write an article about Jurin Ratchapol, to remember the 15th anniversary of his assassination. Having no previous knowledge about this man and the story behind his murder, I searched the internet in order to find newspapers articles which could enlighten me. Here is what I discovered. Jurin Ratchapol, was a leading activist against shrimp farm development in the province of Phuket (a popular tourist destination in the South-West of Thailand). Jurin appears to have been a very passionate man who fought feverously to protect the natural environment against wealthy developers. His campaigning efforts stimulated two very different reactions. On one hand, they drew positive attention and encouraged people to fight for their livelihoods, hence Jurin received an award from Queen Sirikit for his actions. On the other hand, his campaigns were not well perceived by neighbouring shrimp farm owners who regularly sent him death threats. In the end, Jurin’s passion and bravery caused his murder on Januray 30th 2001. He was shot while simply picking cashew nuts in is village. The murderer, who was a former worker of the neighbouring shrimp farm, which was encroaching on the community’s mangrove, was sentenced to life imprisonment. I was eager to discover if the situation has improved in Phuket, 15 years after this tragic event. Did Jurin Ratchapol’s murder raise awareness and trigger positive actions among the population of Phuket? What is the current situation for mangroves in the area? How much mangrove area is left? Do we even know? Comparing data from the FAO/IUCN, it appears that the total area of mangrove coverage has decreased by 1200 ha from 1975 to 2007. In fact, Phuket’s sustainability indicator report indicates that between 1975 and 2012, almost 70% of all forest areas in Phuket and Phang Nga had been encroached on. In addition, about 150 ha of mangrove forests in the province have been damaged. Mangroves lost at what future cost? The most recent news I found on mangrove encroachment in the province, just 7 months ago was in June 2015, where villagers from Suwan Pa Bang Khanun in Thalang (a northern district of Phuket) complained about encroachments on the mangrove forest and building of illegal structures in this area. Phuket’s Vice Governor, Somkiet Sangkhaosutthirak, solution was to install a clear delimitation and signalization of the boundaries of the 6.5 ha mangrove forest. Moreover, in March 2015, the navy led an investigation into an ATV tour company and five shrimp farms for alleged encroachment of more than 30 ha of mangrove forest in Pa Khlok. In the same month, dispute over land also occurred in Bang Sai beach, near Cape Yamu on the east coast of Phuket, as recently planted mangroves had been uprooted and advertising signs were installed. Disaster Risk Reduction: Green or Grey? The coast of Phuket is highly affected by erosion since the Tsunami event in 2004. As a response the government appears to be favouring the construction of seawalls instead of mangrove rehabilitation. In fact, multiple proposals were formulated in July 2014, by the Cherng Talay mayor and Phuket’s Governor Maitri Inthusutto, to build seawalls to protect Phuket’s beaches. The seawalls would be made out of either sandbags, gabions (cages filled with rocks), revetment (sloping wall), or concrete. Let’s hope it’s not too late! On the bright side, a couple of mangrove restoration and protection projects have also been occurring in the past couple of years. In September 2013, as part of their Green Initiative, staff from KEE Resort in Patong (on the west coast of Phuket) and school students planted 500 mangroves in Pak Klock, on the east coast of the island. In August 2015, Navel personal, local officials and students planted thousands of mangroves in Phuket for the celebration of Queen Sirikit’s 80th birthday. These events also helped raise awareness and promote rehabilitation and protection of mangroves among Thai people. Despite these efforts it is clear that, since Jurin Ratchapol’s death, no solutions or agreements have been found as encroachment of mangrove areas continued to occur in 2015. There is still many actions and fights to overcome for restoring and maintaining mangrove areas as well as for ceasing their destruction in Phuket. What’s Phuket’s future without mangroves? Sea defences from wind and waves, erosion control, local fisheries livelihoods, seafood, coral reefs and eco-tourism, coastal water quality all depend on healthy mangroves ecosystems. If Jurin returned to Phuket today would he be proud or saddened by what he saw? FAO and UNEP, 1980, South China Sea fisheries development and coordinating programme: The Present State of Mangrove Ecosystems in Southeast Asia and the Impact of Pollution, Manila. Society Environment Economy Knowledge (SEEK), 2013, Phuket Sustainability Indicator Report: SEEKing a Sustainable Phuket, Phuket, Thailand.